Explore the depths of our ocean planet like never before! 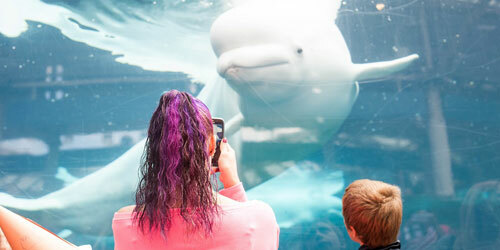 Travel Mystic Aquarium’s indoor and outdoor exhibits and visit thousands of creatures including beluga whales, African penguins, rescued seals, colorful fish and more. Be thrilled – or chilled – by the funky features of over 30 different species of amphibians then roll up your sleeves and touch a shark, stingray or even an exotic reptile. Daily complimentary sea lion shows provide a truly unique opportunity to see these fascinating animals up-close and in action. Enhance your visit with one of our exclusive encounter programs where you can go behind the scenes to meet and interact with your favorite animal. Then step in to ‘Jurassic Giants: A Dinosaur Adventure’ to encounter 12 animatronic dinosaurs. 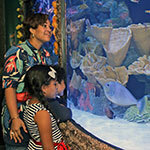 Plus, special events and activities all year long make the Aquarium a destination worth revisiting often. SEA more at MysticAquarium.org.